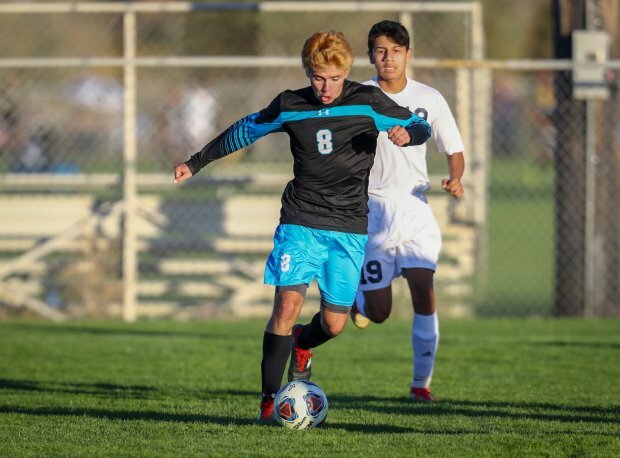 With the New Mexico 5A boys soccer championship on the line and a third overtime looming, Gabriel Legendre had an opportunity to give Cleveland (Rio Rancho, N.M.) its first state title. With Cleveland and Mayfield knotted at 0-0, Cleveland was awarded a penalty kick. For the last three years, Legendre had taken every one of his team's penalty kicks. Coach Shaun Gill called on his junior in the biggest moment in program history. 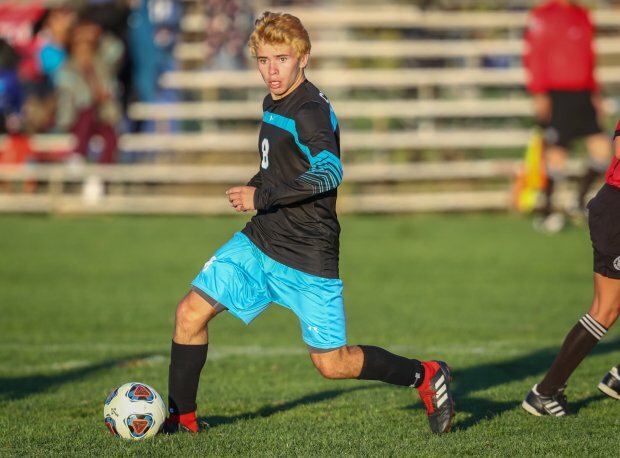 "I really wanted to take that penalty but my friend (Jairo Barreras) came up to me after the penalty and him being a senior and his last year, this could have been his last chance to ever win a state championship for our high school," Legendre said. "I decided to give it to him so he could be the one who won it for us." Barreras buried the shot in the back of the net to give Cleveland a thrilling 1-0 victory in double overtime. What Legendre did to allow his teammate to shoot the game-winning goal was typical of what Gill has seen from his star player for years. "He's a total team player," Gill said. "He wanted somebody else to get a little bit of the glory. He is not in the glory business for himself." Said Legendre: "I don't play just for me. I play for my team, my school and who we represent. At the end of the day, if we win that's all that matters." Legendre, who is a forward/midfielder, doesn't need the notoriety but he deserves a ton of the credit for his team's phenomenal 20-3 state title season. He notched 32 goals and 13 assists, playing a part in nearly 60 percent of his team's goals on the season. "He's the total package," Gill said. "He's the real deal." After his great, unselfish season, Legendre was one of 150 high school juniors named as Allstate All-Americans in December and will be considered for participation in the Allstate All-America Cup this summer in Orlando. "It's a big honor for me," Legendre said. "I've worked really hard to get where I'm at right now. I'm very excited and it means a lot to me." Gabriel Legendre in action during Cleveland's Class 5A quarterfinal win over Atrisco Heritage Academy. Legendre didn't come out of nowhere this past season. He had a strong sophomore campaign in which he tallied 25 goals. He upped goal and assist totals as a junior and become more of a well-rounded player. Gill has watched Legendre's confidence continue to grow. "He's a lot more confident on the ball," Gill said. "He's willing to take players on one-on-one now. As soon as he receives the ball, his touch is so good he doesn't even have to look at the ball anymore. He has his head up looking where the defense is at and he's looking for more combination plays, trying to isolate a defender and try to get around him with a one-two pass. He's a lot more dangerous and penetrates a lot better this year." Legendre has proved he's just a natural goal scorer. "He has a nose for goals," Gill said. "He gets the ball; he has his head up. He's looking where the defense is and he's looking to either get a pass and move off the ball or just go and shoot." Legendre credits his teammates for being the biggest reason he's a big-time scorer. "Also, practice," Legendre said. "I work very hard during practice, working on my shooting, working with other players, working on their shooting, their passing, my passing. As a team, they help me get the goals." As an eighth-grader, Gill had Legendre training with the juniors and seniors on the varsity squad. By the team Legendre hit high school, he was a leg up on his fellow underclassmen. Legendre excels at possessing and dribbling the ball and is deadly when he gets near the net. He's ambidextrous with his legs and can score from any angle, noted his coach. The 17-year-old said his offensive style on the soccer field is getting out in the open field and making things happen. He can score in a variety of ways. "The main one I usually do is making runs," Legendre said. "They send it over the top, I get the ball, deke out a couple players and I finish it." At 5-foot-8, Legendre is never the tallest player on the field but he uses smaller stature to his advantage. Gill said if defenses don't mark up on Legendre, he can get behind players and burn them. Being tucked away just outside of Albuquerque, soccer sometimes doesn't get a lot of exposure in Rio Rancho. Legendre is trying to change that. Colleges are starting to trickle in and take notice of Legendre's rare talent on the field. The University of Washington is the most well-known school that's been in touch with Legendre. Legendre should garner more exposure this summer while playing for the New Mexico Rush '02 club team. If he has time, he might also head to Sweden to participate for another club team. Gill hopes Legendre shows college coaches around the country his full capability on the field. "He's a special talent," Gill said. "Great attitude, great teammate."